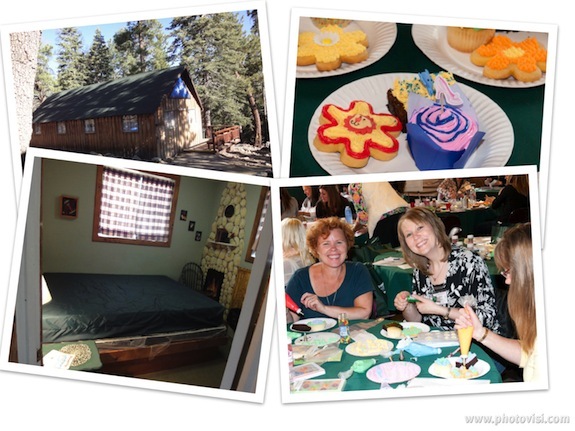 There has been much chatter over the past several months about Camp Blogaway. Whether you have been reading my blog or are a fellow food blogger and/or camper, you are probably familiar with Camp Blogaway. I signed up to be a happy camper many months ago when I was just at this food blogging thing for a very short time. Fresh air here we come! You’ve just gotta eat here when in LA! My 6 month blogiversary will actually be on the 23rd of May, so as you can see, I am still new to this whole food blogging gig. That was one of the reasons I decided to join in on the fun! I wanted to learn what I didn’t know about food blogging, better the skills I did have and get to meet fellow bloggers that I “know” by networking online. Well, I have to say, that camp did not disappoint! This truly was a great weekend and I met some really incredible people. I was very impressed by the attendees, the sponsors and everyone that had a part in the entire Camp Blogaway event. The greatest appreciation goes to Patti Londre at Worth The Whisk for coming up with the idea in the first place! She is beyond enthusiastic and very funny, I might add. Everyone needs a little comic relief at 7,000 ft. Knockers up! (It would just take too long for me to try to explain that one…). For those of you that know me personally, you will know that this must have been a really big deal for me if I was getting on a plane to get there! I am not the most relaxed flier (can you say WHITE KNUCKLE?! ), so I wanted to go to camp in a really bad way! Of course, this fear of flying problem is nothing that a Xanax and a vodka and oj can’t fix, so away I went! Mr. Bunkycooks was traveling with me since we were making this a bit of a holiday, so I also had him to grab onto just in case the plane started an unexpected descent (isn’t that what they always say…unexpected loss in cabin pressure…well, I hope it’s unexpected! Surely the airlines don’t plan for that to happen…). We arrived at LAX from Atlanta just about in time for lunch (which was late by my watch), but now we were on West Coast time. 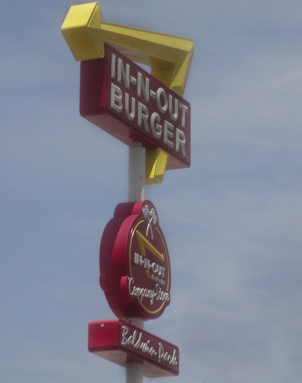 My hubby sure knows how to treat me right when it comes to dining, so we stopped at In-N-Out Burger on the way to camp. Gotta get ready for camper food! We were so excited to get to camp, that my husband was speeding driving at a brisk pace up the mountain. Very close to camp, we even ran someone off the road had someone pull over for us. At first glance, I thought it was Cristina from Teenie Cakes! 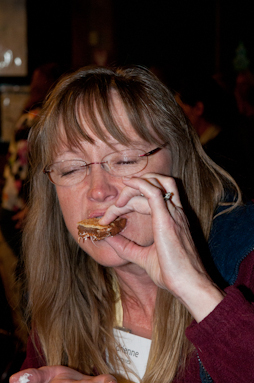 As it turns out, it was not her, but she sure looked like a food blogging camper to me! If you are reading this and that happened to be you, sorry! 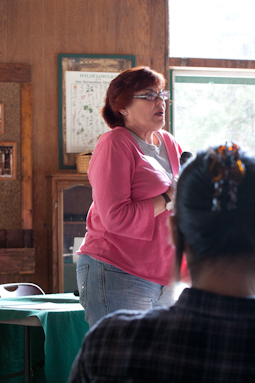 Once we arrived at camp, we were greeted by Patti (our fearless camping leader), registered and then were given our cabin assignments. You might remember that I begged shamelessly for a private room and did win one, so I was really excited when I saw my room complete with a fireplace (just kidding – it was painted on the wall!). Mr. Bunkycooks accommodations were not quite as nifty, so I was sure to keep my own space for the two evenings at camp! We were really busy the entire weekend with activities (starting with the Wilton cake decorating session when we first arrived), presentations by our guest speakers and PR panelists, eating, drinking (lots and lots of water!) and socializing the entire event. I thoroughly enjoyed photographer Art Ramirez (as well as getting to know both he and his wife, Adrienne), food stylist Denise Vivaldo (what a hoot! ), Barbara Gibbs Ostmann , Danny Jauregui, Casey Benedict-Pendergast and all the sponsors and PR panelists who shared thoughtful insights and gave great advice to all of us campers. 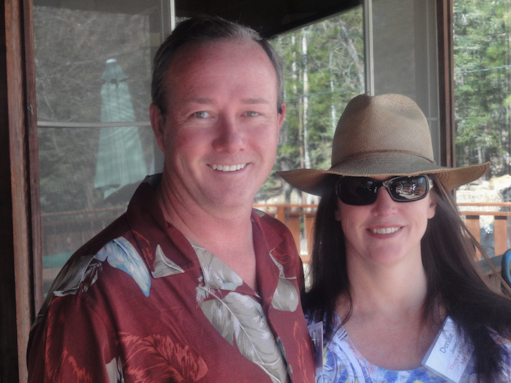 John & Denise – There’s a Newf in My Soup! This is an excellent and personal post with fantastic photos! Pretty nice room you scored there Ms. Bunky! Your husband was so sweet and concerned when he approached me about running me off the road (LOL!!) and so cute of you to mention it. =) It sounds like you had an all-together great visit out to California. It was great to meet you and I hope we’ll have the opportunity to meet again. I’m envious of your dining visit to Bouchon’s! Mr. Bunkycooks was terribly distraught when he thought he ran you off the road, so I am glad it was not you! It was a pleasure to meet you and yes we did have an awesome time in (not so sunny while we were there anyway) California! BTW, Bouchon was very good, but I bet some of us food bloggers could give the place a bit of competition! What a great post. You’ve captures so many of the highlights (as if altitude sickness could be consider a highlight), it’s fun to read through and think, “I was there!” It was great to meet you. I look forward to hearing about more and more of your culinary adventures! It is fun to look at the pics and remember the weekend. It was a really great experience! I hope I get to see you again sometime in my old Philly stomping grounds! Dear Gwen – Thanks to your post it feels like I am able to experience the camp right there with you. What thoughtful writing & a lovely personal journey. Oh! Before I forget – You look gorgeous in the pics and Mr. Bunky & you make such a cute couple…ADORABLE! Thanks Greg! It was delightful meeting you as well! I miss everyone already! 🙁 I would love to attend either event coming up. Maybe I can round up a sponsor! Well done, camper! 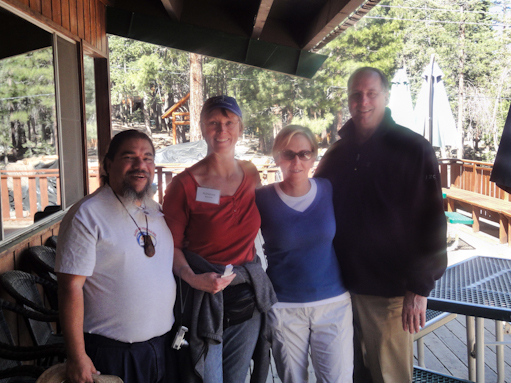 We Californians were excited to host you and am glad you survived our wilderness adventure. Mr. Bunkycooks was a great contributor to our weekend, too. Hope to see you again. Fun recap. I too, will never forget Knockers Up. And I was probably one of those people you ran off..oops, let pass me by on the road. Oops! I hope it wasn’t you! It was nice to meet you Cynthia. Thanks for bringing all the yummy golden kiwis! We are addicted! Now I just need to find them back home. what an incredible trip, it looks like you had such a good time!!! I would love to attend one, maybe we should try to have one in Virginia, kind of between the two of us! Way to go to make a girl jealous!!! What a great recap – I nearly felt like I was there – altitude sickness and all!! what a fun weekend, i am so glad you were able to attend..loved all the pics.. Thanks! It was a fun time. holy cats and jammer kids – what an event ……whoa – hoa…. LOL! It wasn’t quite that exciting, but I am happy that it looked that way! We did had a great time meeting everyone and it was truly a jam packed weekend. Looks like you had fun and you lived to tell the tale! Nice to see all the pictures, it reminds me of girl scout camp, did you have a camp name? Did you make lanyard keychains? I hope you come out to SF in November, you might find a room with a real fire place(lol) loved the one in your room at camp! What a fun event, thank so much for sharing your experience and pictures! Gwen – Excellent post on Camp, and congratulations on your 6-month Blogiversary! Keep up the good work. I was hoping to see some photos from Bouchon 😉 I’m planning on preparing a Salad Nicoise for our first Concert in the Park “Taste of Provence” theme and would love to see Keller’s take on it! Looking forward to visiting BunkyCooks often – it’s so nice having met the wonderful people behind it! Take Care. Gwen, Congrats on your 6 month blogiversary and a wonderful post on camp. It was a delight to meet you and Roger. I look forward to following your post. 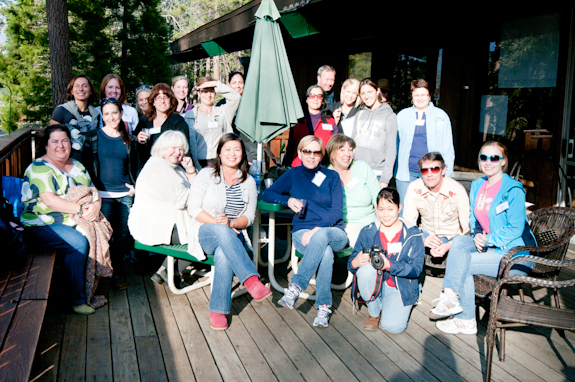 Lovely Camp Blogaway recap! Since I never got around to mine, maybe I’ll just do a quickie recap and do links to all of yours. Hope we’re able to get together again soon!!! I miss y’all already! 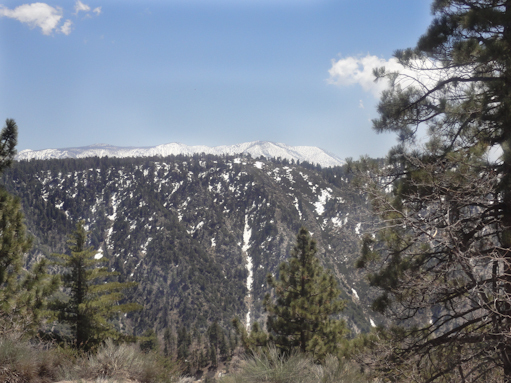 I have actually never heard of Camp Blogaway, it looks like an awesome time and I am totally jealous of your mountain fun! Look forward to reading more about it! Stuffed Portobello Mushroom – A Meal for One!